This area map of New York and Pennsylvania highlights locations linked to the Book of Mormon and the establishment of the restored church. 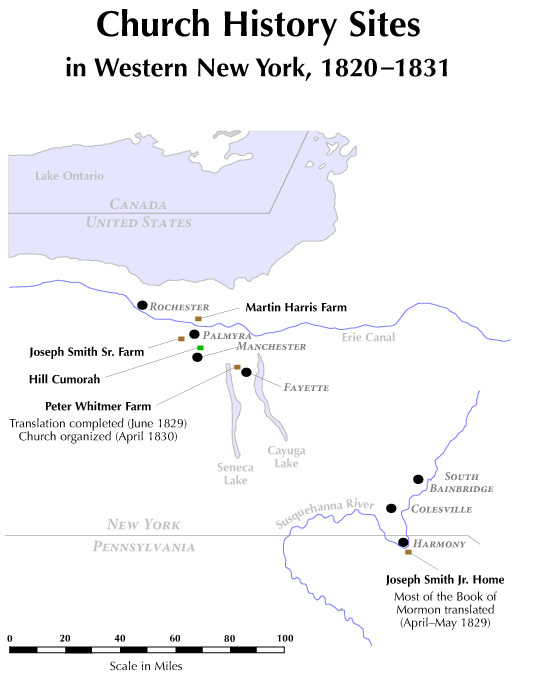 Fleeing persecution in Manchester, New York, in December 1827, Joseph and Emma Hale Smith settled in Harmony, Pennsylvania, where Joseph would translate most of the plates. In June 1829, Joseph (and probably Emma) moved about one hundred miles to Fayette, New York, where that same month the Three Witnesses were shown the plates (a few days later the Eight Witnesses saw the plates in Manchester) and, in the Peter Whitmer home, the translation was completed. It was in the Whitmer home that the church was organized on 6 April 1830. Other church history sites in southern New York include South Bainbridge, where Joseph and Emma were married on 18 January 1827; Seneca Lake, where several people were baptized during the early years of the restoration; and Colesville, where the church’s first branch was formed in October 1830.